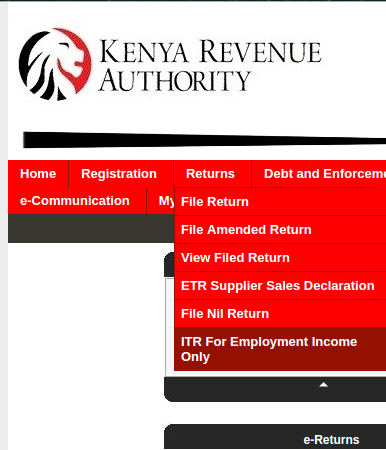 iTax is Kenya Revenue Authority's online tax management portal. With effect from August 1st 2015, the authority no longer accepts manual filling for VAT, PAYE and Income Tax returns. All returns are now made online. This is a welcome move for many Kenyans who for years have had to endure queues at KRA offices countrywide. The online portal allows for convenient electronic filing of returns from the comfort of one’s home or office and also eliminates the need for tedious physical paperwork. For employed Kenyans, it is especially easy to file an employment income tax return. It takes less than ten minutes once you have all the figures with you. 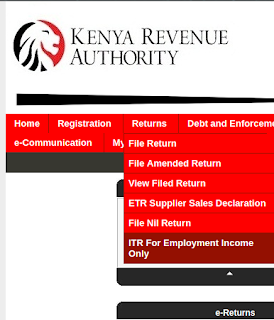 Ensure you have a KRA P9A form (tax deduction card) from your employer. This form is completed by your employer and shows the annual gross salary earned and non-cash benefits, deductions such as NSSF and pension contributions, and the amount of tax remitted to the Kenya Revenue Authority in the preceding year. Request your employer to provide you with the form before the 30th June every year. Your PIN (Personal Identification Number) number. An iTax account. If you don't already have one, visit https://itax.kra.go.ke/KRA-Portal and log in using your PIN. Once you have the P9A form, log into iTax. Under the returns tab, scroll down to ITR for Employment Income Only and click as shown below. Enter the year in the format 01/01/yyyy to 31/12/yyyy where yyyy is the year e.g. 01/01/2012 to 31/12/2015. Select the "Yes" radio button and click Next. Defined contribution is your total retirement contribution i.e. NSSF plus any other pension contributions. If there are no errors you will get an on-screen message notifying you that your submission is successful. Ensure that details captured on the P9A form are a true reflection of what your employer deducts from your salary. If you find a discrepancy, ask your employer to rectify and if they don't comply report them to KRA discreetly. If you have other income over and above your employment income, you will need to download a separate excel spreadsheet in order to file your returns. If you had no income, simply file a nil return from the Returns drop down menu.